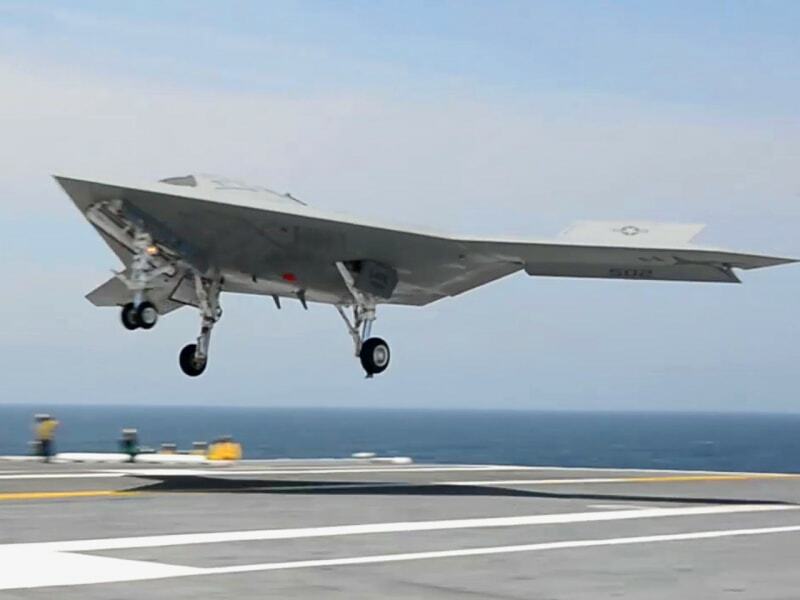 The X-47B drone made history Wednesday as the first robot to land itself on the moving flight deck of an aircraft carrier at sea, according to U.S. Navy. The machine, named "Salty Dog 502," took off from the Naval Air Station Patuxent River on a flight headed to the USS George H. W. Bush, in the Atlantic off the coast of Virginia. That carrier deck is familiar turf for the drone. On May 14 this year, it executed a first time "catapult takeoff" and landed successfully at Patuxent an hour later. While it's never attempted a water landing before, the craft performed a carrier-style "arrested landing" at the base in mid-March, a similar maneuver to the one it will execute today. During that dry run, it landed on the runway and hooked a length of cabling, which yanks it — "Top Gun" style — to a short, rapid stop. 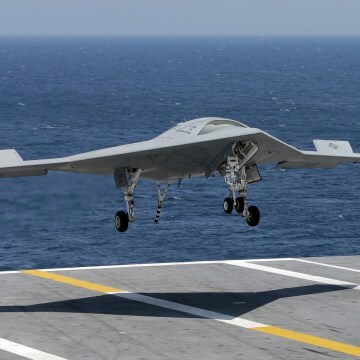 The drone will use GPS and navigation software to land on the aircraft carrier's deck, tackling turbulence and air currents without immediate assistance from a human pilot, wrote Capt. 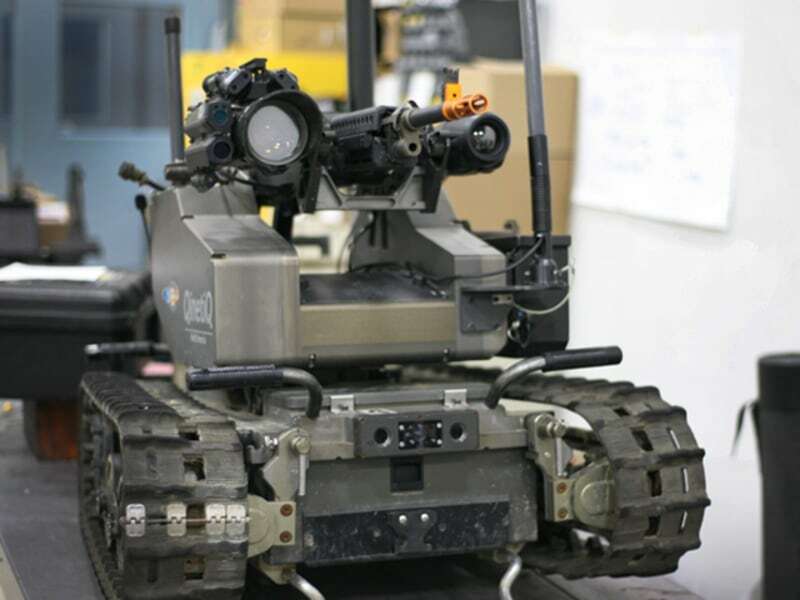 Jaime Engdahl, program manager of the Navy Unmanned Combat System, in a blog post published on Tuesday. Among drones, the X-47B is uniquely prepared to handle a landing that's considered among the most difficult for human pilots as well. It carries some of the most sophisticated autonomous programming of any unmanned craft out there today. It's also capable of cool carrier-friendly tricks: Though its wingspan measures 18 meters, the wing tips fold up to make the plane easier to stow. 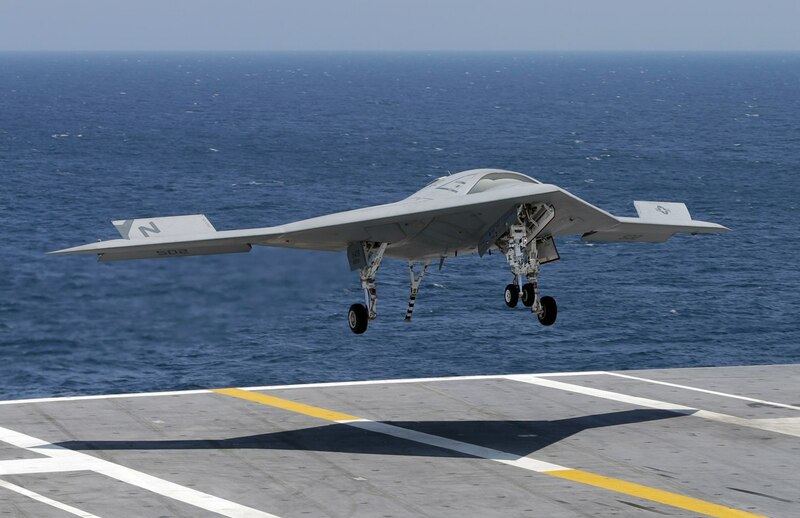 The X-47B was made by Northrop Grumman as part of the Navy's Unmanned Combat Air System Demonstration (UCAS-D) program. It won't ever be used in military operations but lessons learned in building and testing this model will be carried over to more autonomous drones of the future. The carrier landing is also the drone's swan song. After the events at sea this week, Salty Dog and its twin — the only two X-47Bs in existence — will be return to Patuxent, be demilitarized, and packed off to the Navy museum. This story was updated at 1:55p.m. ET to reflect the successful carrier landing.